First of all we would like to thank you for all that you have done for Phi Tau. Without our alumni we would not be where we are today. The enthusiasm and support you have shown to this chapter can not be rivaled. It is brotherhood in its truest form. We want to continue to grow the relationship between the Resident Council and our Alumni by keeping everyone connected to the happenings of the chapter. We will be holding a brunch before the Kentucky game on October 21. 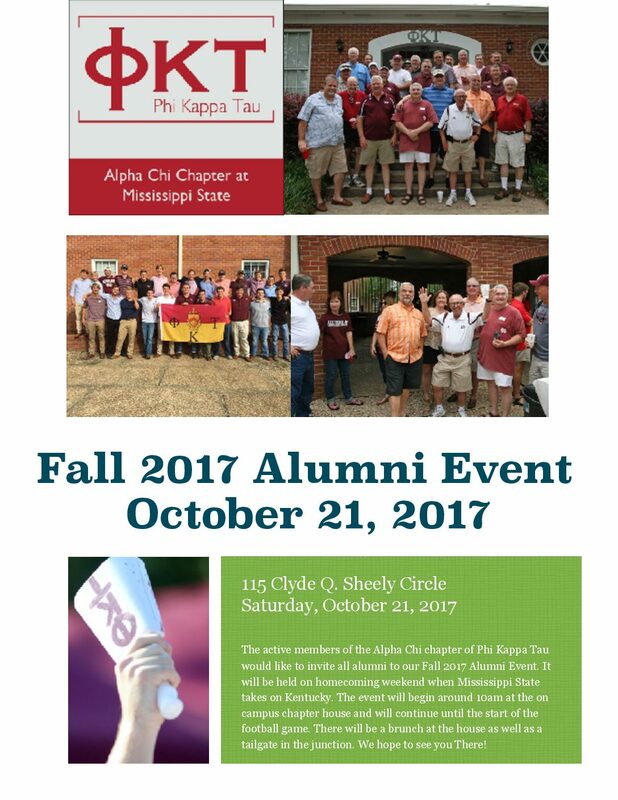 The active members encourage all Alumni to come to the on campus house and our tailgate in the junction! My first exposure to Phi Kappa Tau was during the fall rush season in 1958. That evening Bill Ware, Richard Fallin and I were in our Old Main dorm room when a knock on the door was heard…we were concerned…we were looking to avoid short haircuts and whatever else the seniors would likely be doling out to “frosh”. We did get up the courage to open the door and after hearing about the fraternity, we accepted their invitation to the house. At the rush party we were impressed with everyone we met and let them know we would like to join. Some of my fondest Alpha Chi memories are: the daily interaction with all the pledges and members, eating a lot of humble pie as a pledge…washing my big brother’s new car a lot, initiation, the weekly meetings in the 304 South Jackson street attic chapter room, being a big brother to Steve Felts, “shooting the bull” sessions and the socials. I was honored to receive an outstanding pledge and later and outstanding member award. The best memory of Alpha Chi of Phi Kappa Tau will always be the people. I learned so much from them. Finally, over the years staying in contact with Bill Ware, Ed Graham, Gary Hawkins and Bill Jones has been very special. I look forward to the April 30th get together and also to remembering our brothers that have passed. P.S. I salute Gary Hawkins for what he has done for Alpha Chi and Phi Kappa Tau Fraternity as a whole. Three combat tours in Vietnam flying the F-4 from South Vietnam and Thailand. 254 Combat Missions (190 out of country/North Vietnam) and 543 Combat hours. Flights under his leadership downed 5 enemy aircraft (3 are credited to him). On 5 other missions caused enemy fighters to break off attacks on friendly aircraft. No flight members lost. Saved wingman from missile attack. Larry Kirk is a retired business executive and community leader and lives in Tupelo, Mississippi. Kirk grew up in North Mississippi, graduating from West Union High School in 1964 and Mississippi State University in 1968 where he was a brother in Alpha Chi chapter of Phi Kappa Tau fraternity. He studied further at the University Of Mississippi before enlisting in the U.S. Army in May, 1969 and served a 13-month tour of duty in Vietnam with the First Infantry Division (Big Red One) before being honorably discharged in December, 1970. Kirk began a 33-year career with Hancock Fabrics in Tupelo in 1971 as a staff accountant and was named Chief Financial Officer in 1989, including responsibility for MIS and Human Resources. He was elected a director in 1990 and was named Chief Executive Officer in 1996 and Chairman of The Board in 1997. Kirk retired after 9 years as CEO at the end of the fiscal year ending in January, 2005. During Kirk’s time with the Company, Hancock was privately owned for a time, then a separate subsidiary of a large West Coast conglomerate for 15 years and, finally, a publicly-owned New York Stock Exchange Company via a spinoff in 1987 – at the time, one of only two NYSE-listed companies based in Mississippi. He considers the experience of working in and through the different ownership structures as a rare career opportunity. Kirk is a member of the Community Development Foundation, Tupelo’s economic development organization, serving as its Chairman in 2000-2001, and is a director of CREATE Foundation which he chaired in 2008-2009. He currently serves on the Foundation’s Executive and Investment Committees. Kirk has served as a director of BancorpSouth, Inc., a multi-state financial services company, since 1995 and is chairman of its Audit Committee. He is a director of Journal Publishing Company, Northeast Mississippi’s daily newspaper, serving as Executive Compensation Committee Chairman. He has also served on the board of North Mississippi Health Services in Tupelo for a number of years. Kirk is a long-time friend of St. Jude Children’s Research Hospital in Memphis and served on the ALSAC-St. Jude Advisory Board for many years. In 2003, he was awarded St. Jude’s Healing Rose award for humanitarian service. During his tenure as CEO of Hancock Fabrics, St. Jude was the Company’s primary charity. Kirk is also a founding member (baritone) of a Southern Gospel quartet called The Landmarks, formed in 1975, whose proceeds also support St. Jude Hospital. St. Jude logo neckties given to the quartet members by the young patients has come to be an identity of the group as it travels around the South singing and raising awareness and funds for the mission of St. Jude. Kirk has been married to his wife, Judy, a retired elementary school teacher, since 1974. They live in Tupelo and attend The Orchard Methodist Church. Their greatest interest is spending time with grandsons Anders (4) and Harris (2) Griffin and daughter, Dr. Meredith Griffin and son-in-law, Dr. Joshua Griffin, who live in nearby Columbus, MS. Growing up in a rural, farming community, Kirk couldn’t wait to get away from that lifestyle. Now, he spends any spare time he has “digging in the dirt” and riding Anders and Harris on his vintage Farmall Cub tractor. It’s no secret that Phi Tau is a brotherhood like no other. We would like to hear about your personal experience with Phi Kappa Tau. Tell us what Phi Tau means to you. How Have You Benefited From Phi Tau?